For many years there has been conflicting opinion and even conflicting research in the value and stability of arch development. One faction steadfastly maintains that arches can not be expanded and remain stable, while others routinely develop arches as a standard requirement for successful treatment. These terms of arch development and arch expansion are usually interchanged and therein lies a great deal of the misconceptions. George Crozat of New Orleans, Louisiana was one of the first dentists to truly appreciate the difference between expanding the dental arches and actually developing the skeletal base that in turn supports the dentition. Just as there is a distinct difference between a dental and a skeletal Class III, we must be able to make the same differential diagnosis between an arch that is dentally narrow on a correct skeletal base, and an arch that is truly skeletally narrow and the teeth are simply “players in the system”. Crozat, Bimler, Schwarz, and Frankel are outstanding names among many who have pointed out the need for us as dental physicians to clinically appreciate this difference. Petrovic, Enlow, and Newmann are again only a few of the researchers who have given us the tools to understand why this difference exists, and how our appliances actually work. Figures one to four are an excellent example of the principles we are going to discuss. This patient’s total treatment time was thirty months. 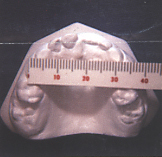 The after photo graphs were made five years following all treatment and retention. There are many very positive things that occur when we develop a patient’s arches to their genetic potential. We will discuss each of these in due course. However, I would be quick to point out that I am not suggesting that all malocclusions can be corrected by arch development. 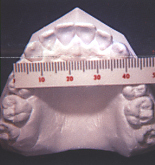 Dental malocclusion, such as arch length loss and macrodontia can not be solved by “overdeveloping” the skeletal arch size. The first obvious question is “What is the patient’s correct arch size?” Unfortunately, this question can not be answered by a finite millimeter measurement. The size of the skeletal parabola which we call arch width is a functional range just like the skeletal profile angle. The actual size of the bony arches is the end result of a number of different functions placed upon these bones. These include proper tongue function, respiration, tonus of the musculature, diet, and genetics. The fallacy of many diagnoses lies in blaming genetics for all narrow arches. We as doctors do have some degree of control over all other causes of a malformed maxilla or mandible. It is not the objective of this article to discuss the various techniques of measuring arch width. If you select Schwarz, Ponts, Korkhaus or simply evaluate the arch size for proper tongue function the principles are the same. We cannot ignore correctly developing the patient’s arches as part of our over-all treatment plan. 1. The maxilla must be fully developed both transversely and sagittally. My appliance of choice is a Schwarz, usually modified into a three directional plate (See Figure Right). If the maxilla is positioned posteriorly as it relates to the anterior cranial base, the appliance is combined with a reverse pull headgear. My objectives with this treatment are twofold. First, I want to eliminate all entrapment on the mandible, especially the lower inter-canine area, so that the mandibular base can be fully developed. Second, I want the size and position of the maxilla to be treated to the point that the mandible can be correctly positioned as a unit to the anterior cranial base This creates a Class I skeletal relationship and allows for normal temporomandibular joint function. This bite opening is caused by “posterior incline plane action” as well as by the lower incisors striking the anterior portion of the Schwarz like a bite plane. 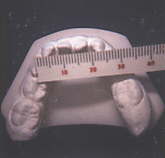 In fact many clinicians incorporate an “active” bite plane on all of their Schwarz appliances when treating a closed bite case that requires arch development. 3. Once maxillary development is underway I will activate the lower arch development appliance. When treating a patient in the mixed dentition we use a Williams appliance (See Figure Right). When the patient is in the permanent dentition I select a lower Crozat. (lower right) The major advantage of the mandibular Jackson or Crozat appliance over the mandibular Schwarz appliance is the body wire. If a lower Schwarz appliance is utilized, one can only expect an increase in arch size due to the action of the expansion screw and the rigid acrylic. However, if the lower appliance uses a body wire as the active force, then the operator can not only increase the lower arch size, but he can also increase lower arch symmetry, increase the lower arch length, and “keystone” the lower inter-canine area. All of these four criteria are critical for a successful treatment and are obtained by using the Jackson or Crozat appliances. 4. Once the maxilla and mandible are fully developed, both transversely can be repositioned horizontally to its correct Class I relationship. This is usually accomplished with an appliance like a Bionator, Rick-A-Nator, or a Twin-block. It is interesting to note that this repositioning will frequently occur or at least improve spontaneously in the growing patient without the use of a repositioning appliance. This further emphasizes the importance of proper maxillary arch development. Most cases that require development also require finishing in fixed appliances. In fact, even our traction cases are usually “treated” with a maxillary Schwarz and a mandibular Crozat appliance to insure correct arch size and to improve anchorage. Ninety percent of the patients I am privileged to treat require some form of arch development. To recognize this need is usually the step to successful treatment. It would be very pretentious on my part not say “thank you” to two gentlemen that help me understand these relationships. To Bert Wiebreck and Charles Cash – you were men truly ahead of your time.